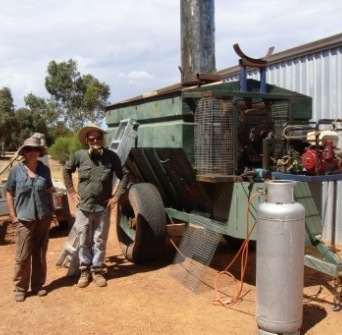 Since 1989 Dr Paul Blackwell has been working to improve the soils in Western Australia. He is based in the northern wheatbelt of Western Australia in Geraldton. Dr Blackwell has been studying methods to improve productivity and land care of the area soils which have poor structure and water repellence. His initial investigations focused on methods of no-till seeding and Controlled Traffic. However, Dr. Blackwell’s more recent investigations are into the value of biochar and biochar-mineral complexes. At the 2007 IBI meeting in Terrigal Australia, Dr. Blackwell presented his initial findings of his work with biochar produced from oil mallee trees. He developed a method of deep banding biochar into soils and then carried out a series of trials with soluble fertilisers and with a new mineral/biological fertiliser to see the impact on both increase in yields, increase in crop resistance to drought (from inter-row water supply), and increase in soil micro-organisms (especially fungi). The first results were very positive—especially with the biological/mineral fertiliser—which resulted in increased yields, greater drought resistance, and increased root colonisation of fungi. 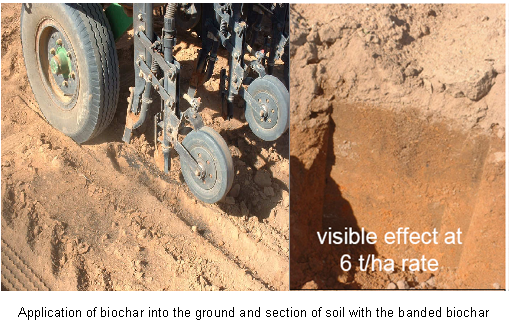 Dr. Blackwell figured that the deep banded biochar probably helped the seed-applied microbes to survive better in a dry soil environment at planting. Following these first trials, Dr Blackwell undertook a range of other trials with different types of biochar produced from wheat and from metallurgical grade charcoal. In 2008, he began a collaboration with Stephen Joseph, IBI Vice Chairman, on the testing of a new product which comprises clay, minerals, and biomass which are heated in an oxygen environment to low temperature (this process is known as torrefaction). The team developed a special rig to manufacture the product and they made samples from local materials. They conducted field trials by growing wheat in tubes which showed significant increases in grain yields. At this time, further research is underway on both summer and winter crops treated with new formulations of the torrefied biomass. Dr Blackwell has also been working on developing an integrated farming approach that involves planting trees, coppicing the trees, and producing biochar and energy. He presented many of his ideas and findings at the Asian Pacific IBI Regional Biochar conference in May 2009 in the Gold Coast, Australia. For more information, contact Dr Blackwell. More work of this type has been performed by the Project Rainbow Bee Eater in Australia in association with CarbonEdge. Click here to read the full report.